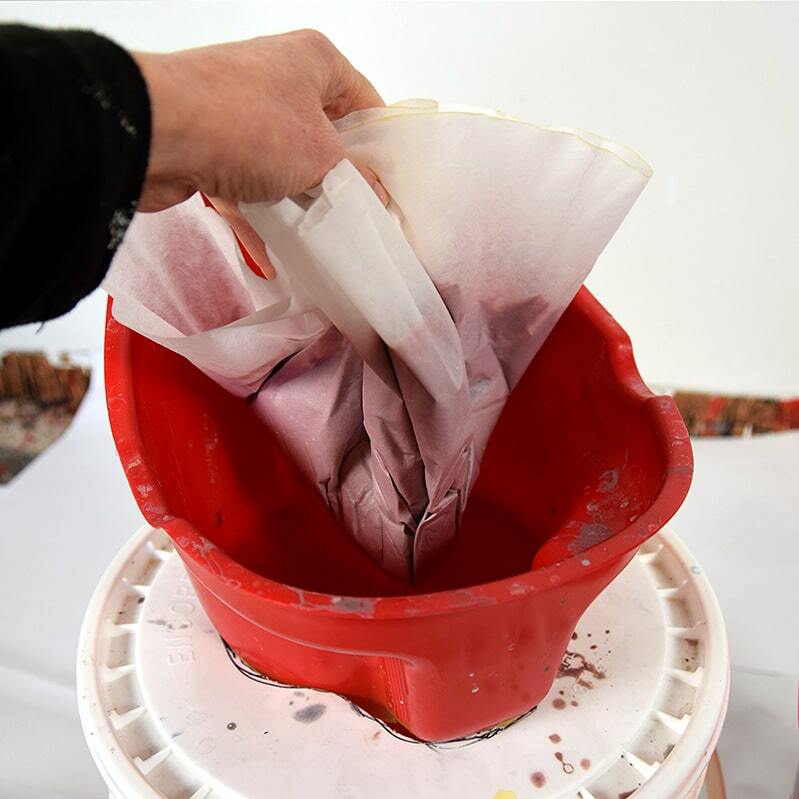 Acrylic waste water contains pigments that are harmful to the environment. 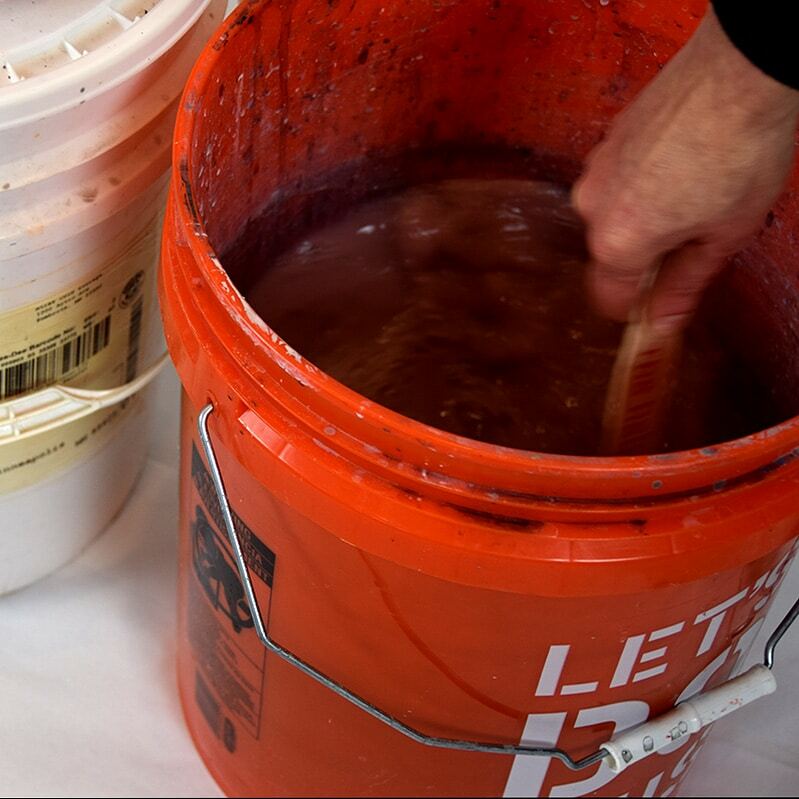 Rinsing brushes in the sink deposits the pigments in our rivers, lakes and oceans. 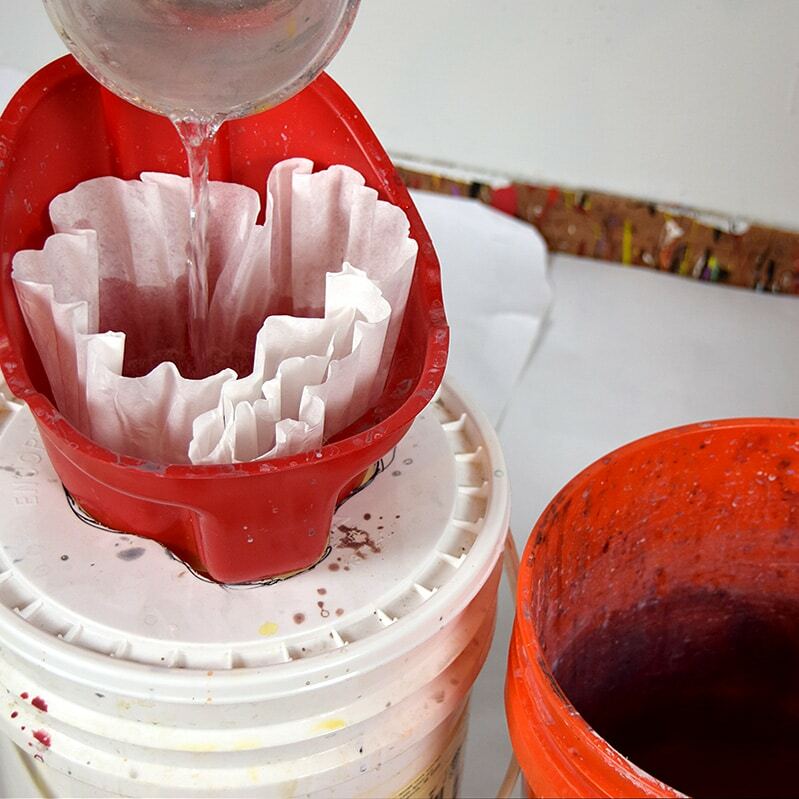 Dump your waste water in a bucket in your studio and every week or so process the paint solids out. I learned how to do this from the Golden website. The article is here. It sounds scientific and complicated but it's really not hard and it will make you feel good about doing your part to help protect the Earth. Please do this. Message me if you have any questions. 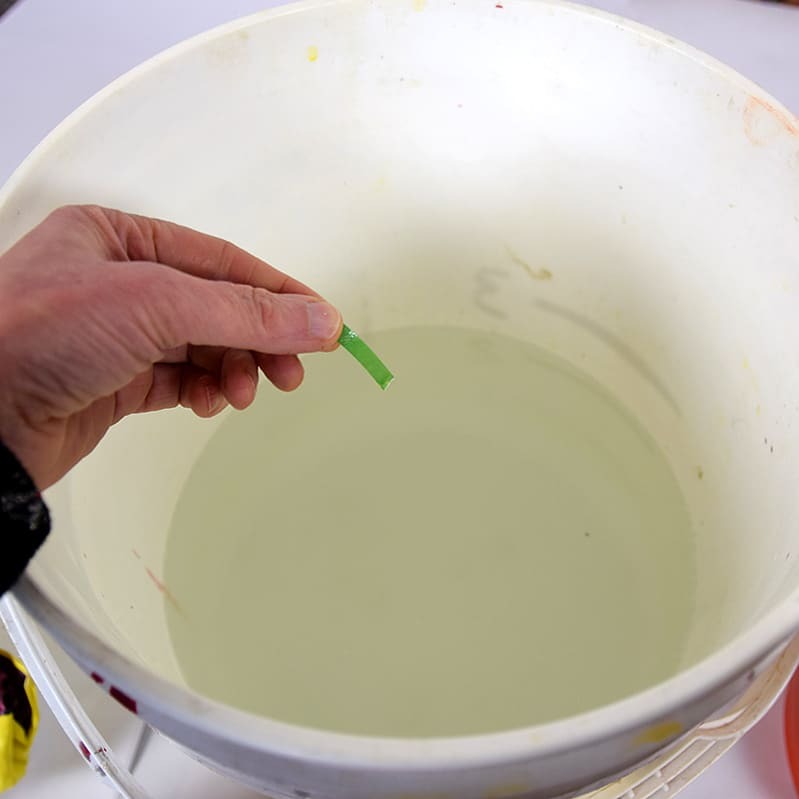 Acrylic paint waste water. What do you do? Dump it down the drain? NO WAY! 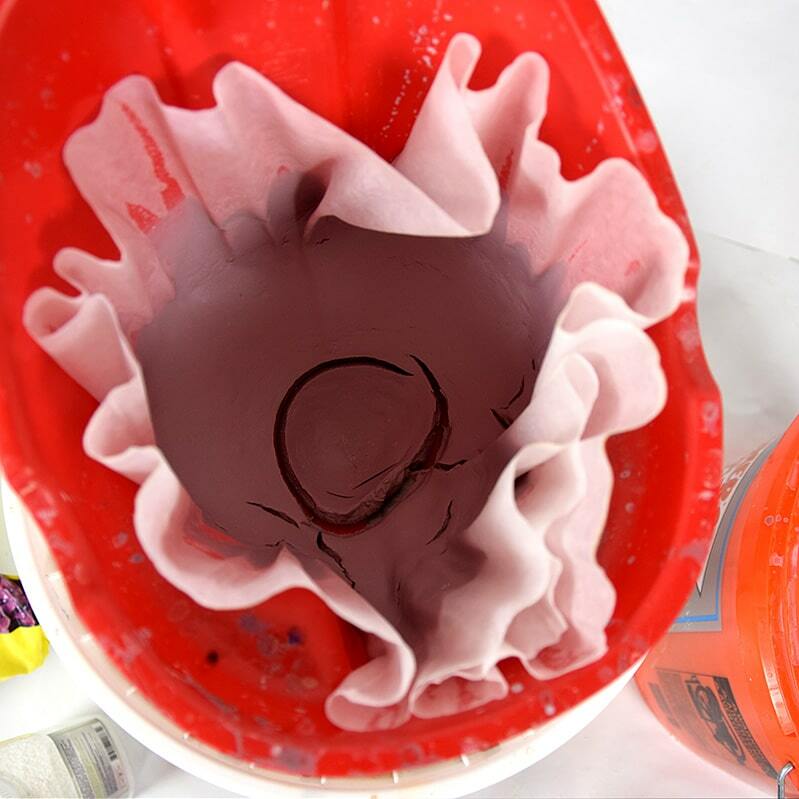 Cut an opening in the lid that fits your funnel. 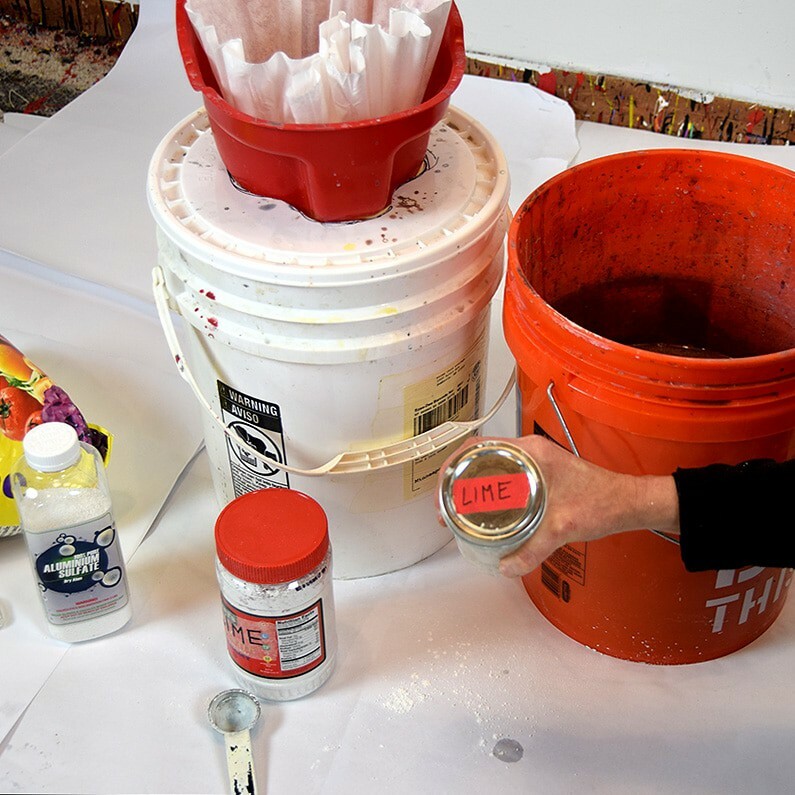 Add about half a tablespoon of aluminum sulfate per gallon. I am processing 2.5 gallons so I'm using 1.25 T. Don't worry too much about exact measurements. Just do it. Add Lime, a scant .75 T per gallon. 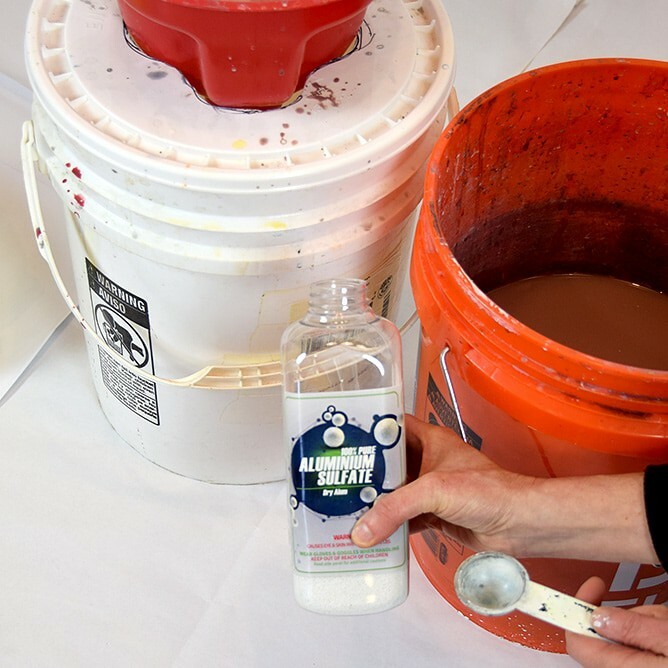 I mix up the Lime in a glass jar with a little water and shake it otherwise it tends to clump up in the bucket and not mix well. 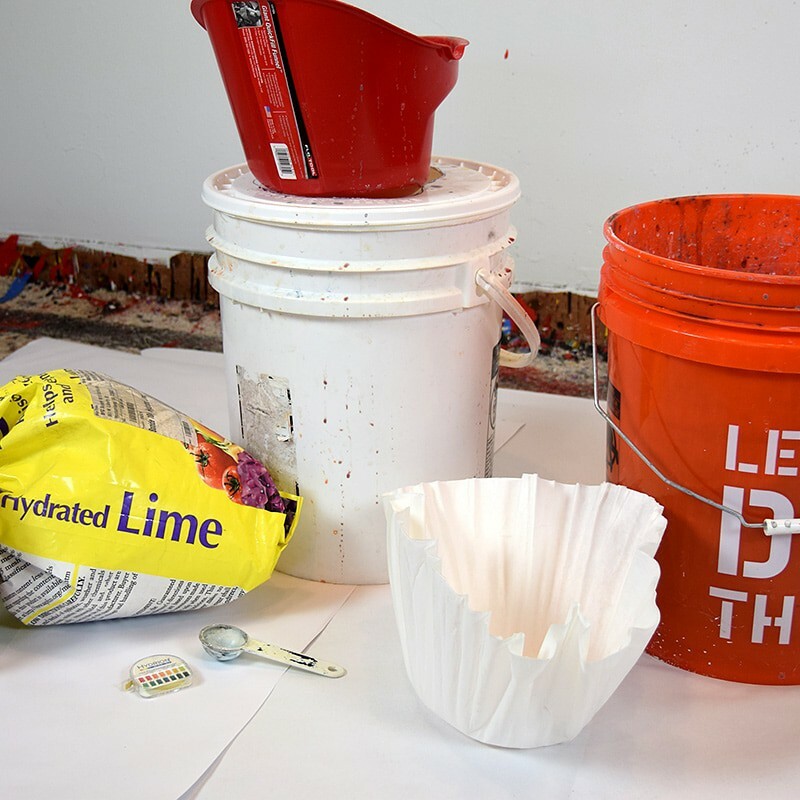 Dump the Lime into the bucket and stir. 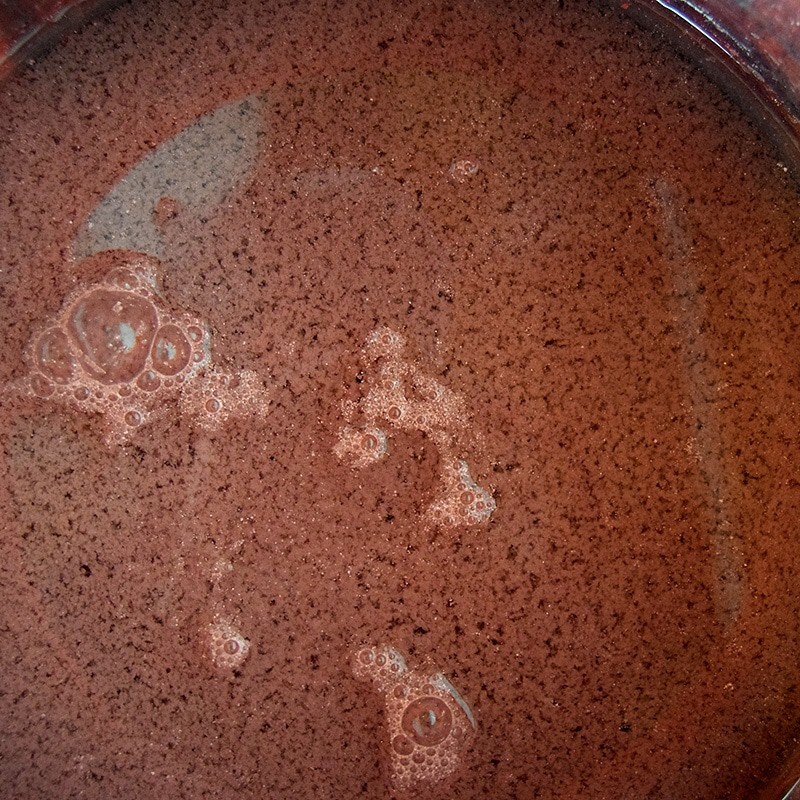 You should be able to see the paint solids start to flocculate almost immediately. I love that word, flocculate, and if you do this you'll have more opportunity to use it. Test the pH of the water. It has to be between 5 and 9. I aim for 6 or 7. If it's lower than 5 add lime. If it's higher add aluminum sulfate. 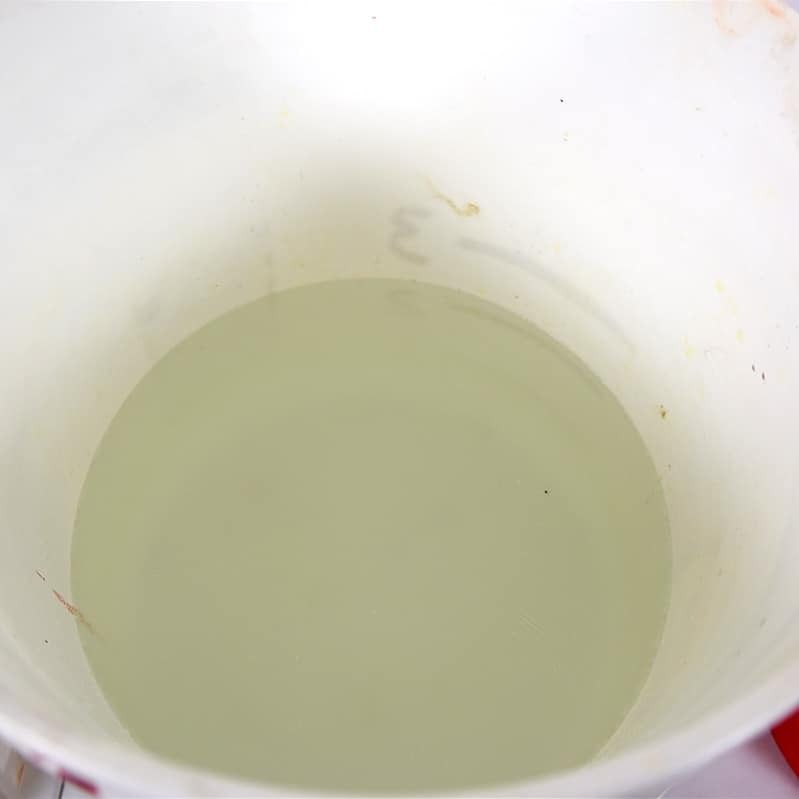 I let the solids settle to the bottom of the bucket and strain out the clear water first. 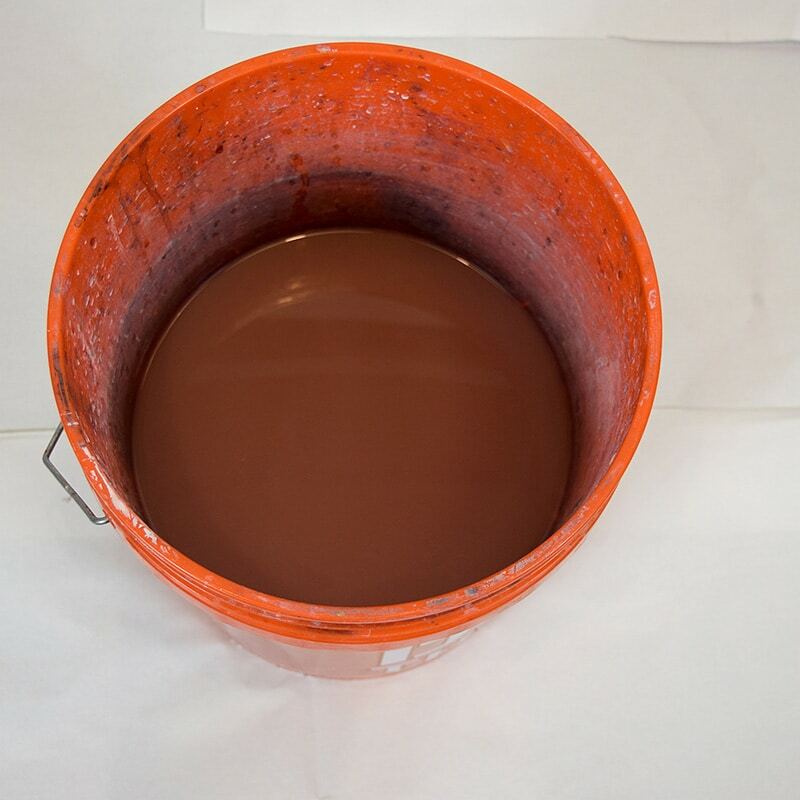 When I get to the bottom of the bucket the water is clouded with the paint solids. It takes longer now for the water to pass through the funnel so I fill it up with the rest of water and leave it for the night. 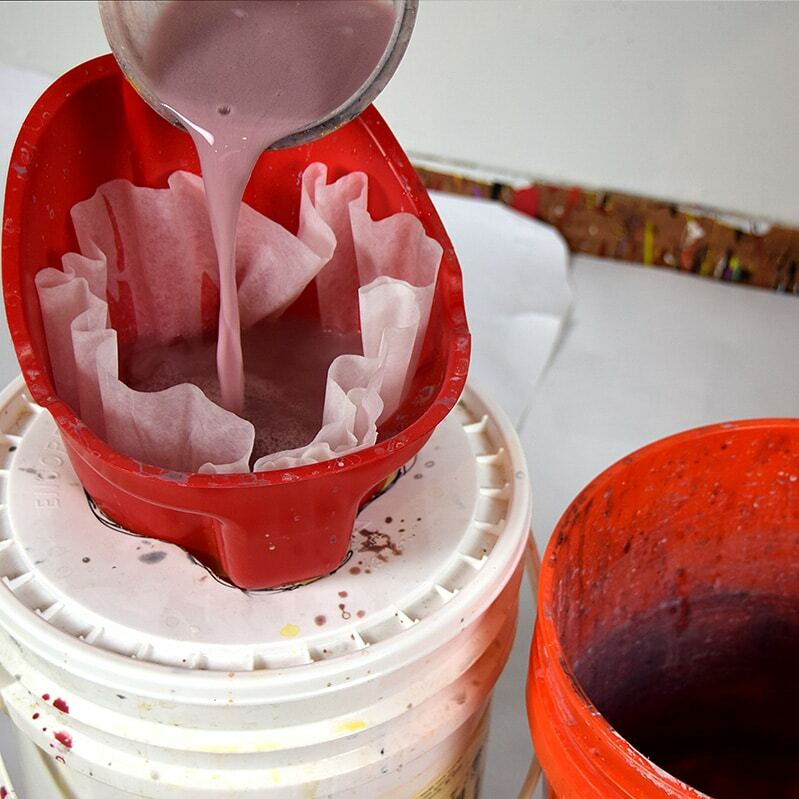 The next day the paint solids are well strained and already beginning to dry out. 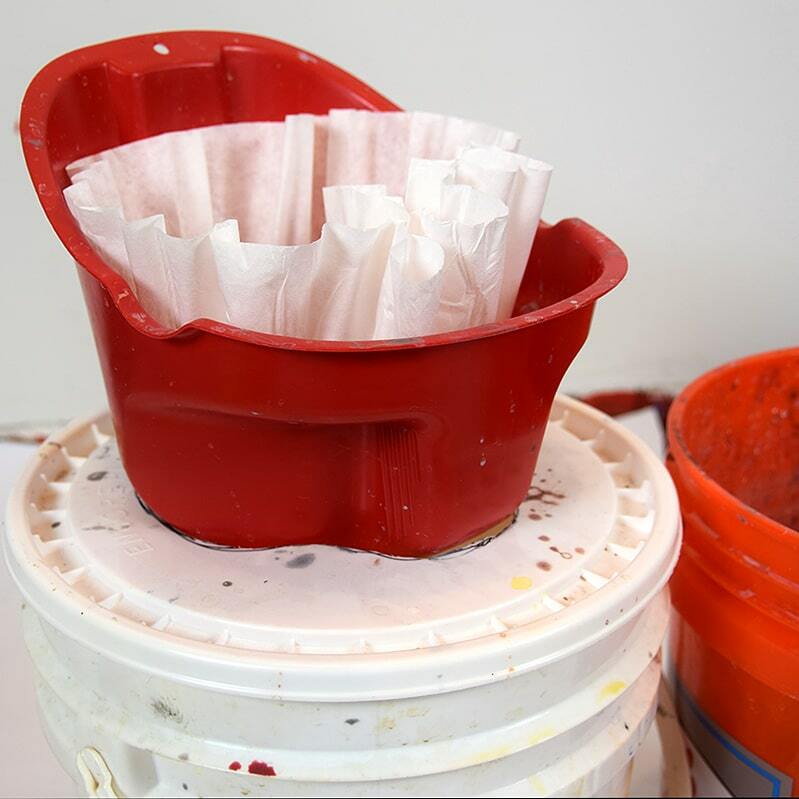 Coffee filter with the paint solids can be thrown in the trash. Et voilà. Clear water that can be safely poured down the drain. I asked a chemist friend and she said it could even be dumped in the backyard or re-used in the studio. 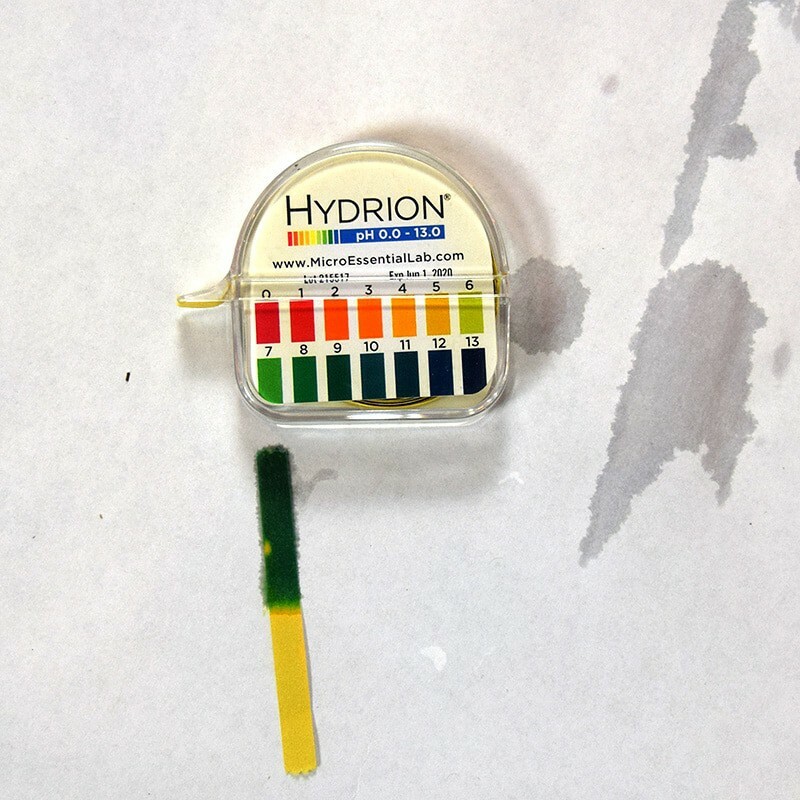 Test the pH, just to make sure it's right before dumping down the drain.